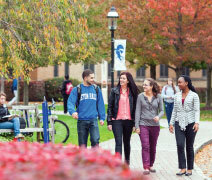 Seton Hall University is located14 miles from New York City in suburban South Orange, New Jersey. Just a short walk from campus, you can hop on the train and be in New York City in 30 minutes, where lots of fun and excitement await—not to mention internship and job opportunities. Number of Faculty: 460 full-time faculty, of which almost 90% hold the highest degrees in their fields; many faculty are Fulbright Scholars, authors, and researchers well known in their fields. At Seton Hall, faculty teach courses—less than 4% of courses are taught by graduate students—so you will receive close personal mentorship from the faculty. • International students are automatically considered for scholarships at the point of admission as long as they submit an SAT or ACT score. Results of the TOEFL (550, 213, 79) may be submitted in lieu of the SAT or ACT, but then the student cannot be considered for scholarships. With a 14:1 student-faculty ratio and average class size of 21, faculty know more than just your name. 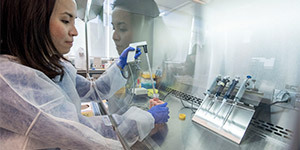 At Seton Hall, you can begin working on research projects with faculty as early as your freshman year, and many students even attend conferences with faculty. At Seton Hall, you’ll benefit from the close mentorship of faculty and a community dedicated to challenging and supporting you. At Seton Hall, you learn from doing.That’s why in addition to countless opportunities for research and scholarship, students can write for one of our three newspapers, work for the #1ranked college radio station in the nation, conduct research for our MarketResearch Center, create public relationsplans for local businesses, develop lesson plans for student teaching, or work in the sports polling center conducting polls commissioned by ESPN. Nestled in the suburban village of South Orange, New Jersey, Seton Hallprovides the safe, quaint charm of asmall town and the hustle and bustleof New York City life only 30 minutes away. Just hop on the train in the center of town and the worlds of entertainment, art, publishing, finance, andfashion; the United Nations; and thousands of major corporations are at your doorstep. This translates to a competitive edge and unprecedented job opportunities, not to mention lots ofcareer advantage. 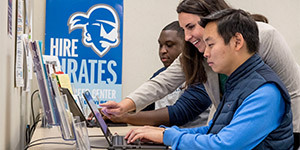 Seton Hall offers more than 17,000 internship opportunities, and more than 81% of studentshave an internship—or two—on their résumés before graduation. In fact,Seton Hall is ranked #4 in the nationfor providing internship opportunities. Seton Hall students have a 90% employment rate and mid-career earnings 50% higher than the national average. Seton Hall offers a comprehensive Career Center, and your career counselor begins working with you freshman year.